Home » Ergonomics » Workfit-Z: Looking after your health while working is now easier than ever. This new addition to the range might just meet your requirements…. After opening the box, the team at Healthy Workstations were immediately attracted to the aesthetic of Ergotron’s Workfit-Z, the stylish grey woodgrain finish is smooth to touch and adds an extremely stylish edge to a workstation, and we agreed it would make a great addition in our homes… But once we snapped out of it and looked beyond the appearance of the product, we were deeply impressed by just how simple and easy it was to use the Workfit-Z. So I volunteered to be the guinea pig and began using the Workfit-Z a week ago; it has already become my favourite ergonomic product. I’ve read a lot about the potential damaging effects of static postures and have been interested in making the change to sit/stand working as I am someone who generally finds it difficult to sit still! Being a night owl by nature, I would tend to start my day sitting down (still not accepting that morning has arrived already! ), but after a cup of tea, I would begin fidgeting and instinctively move more regularly. When I began using the Workfit, I thought it might be difficult to switch between sitting and standing, but the platform has one small lever on the right that is extremely easy to operate and just takes one squeeze. I felt with each sit/stand change, my attention would be focused on my work with less risk of daydreaming, which is often the case when you’ve grown comfortable in one spot. Some of these platforms can be quite large, making it a challenge to incorporate them into your existing workstation. However, the specific design of the Workfit-Z provides an ideal format for changing smaller desks or workspaces into an adaptable sitting/standing area, whether it be at home or in the office. 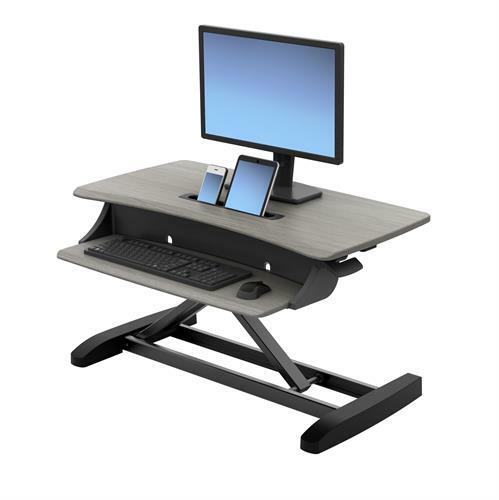 It’s a neat compact converter that sits perfectly on top of a variety of workspaces from desks to countertops for hassle-free, straight-from-the-box installation, without replacing your current furniture – it’s also a great opportunity to create a perfect home office! Before we can begin the sit/stand switch, the biggest challenge can be throwing off our old habits. As office workers, we’ve become accustomed to gluing ourselves to our chairs and the thought of standing up to complete office work can seem a little strange at first; or like too much effort. Ergotron have created an informative handbook to help you progressively embrace the sit/stand change. 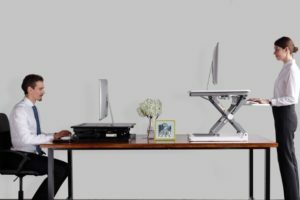 If you need that extra encouragement to begin your sit/stand journey, ergonomic equipment specialists Bakker Elkhuizen have created the product support software Work & Move for you to easily download and use with both electronic and non-electronic sit/stand desks. The software allows you to select if you are sitting or standing, monitoring your duration of this position and prompting you with reminders to switch. As with most desk workers, these pop ups will initially act as a reminder due to our habit to remain seated. However, the idea is that slowly over time we will subconsciously want to move position naturally, helping to avoid any damaging effects in the future. So are you now ready to embrace the positive change?